O’Hara is looking for people who are dependable, coachable, motivated, diligent, and hard working to join our fishing vessels in Alaska. Our vessels typically fish from January through November and we accept applications throughout the year. The weather in Alaska can be severe and temperatures extreme, the hours are long and the work is highly physical. Our success as a company comes from the dedication and hard work of every crewmember. If you are motivated and hardworking, fill out an application today! Our crew members work long hours onboard our vessels fishing in the Bering Sea, Aleutian Islands, and other areas off Alaska’s coast. Work is difficult, highly physical, and fast paced. Our crew members must be able to work as a team living and working together in close quarters. Contracts are 75 days, 7 days a week, with shifts typically 16 ½ hours/day. 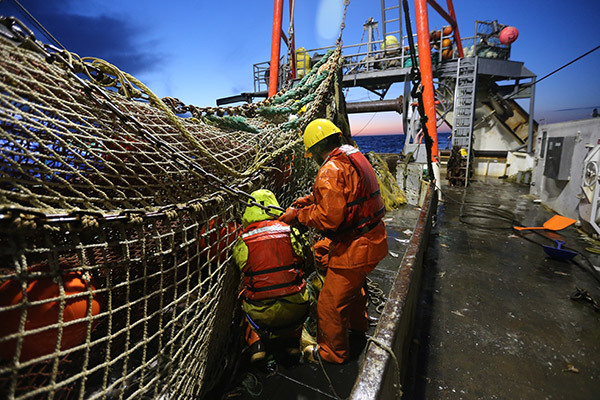 Fishing in the Bering Sea means that crew will experience extreme weather conditions. All applicants must be 18 years or older and authorized to work in the United States. We perform background checks, reference checks, and pre-employment drug screens. Learn more about various positions on our Alaska Fishing vessels. After applying online please allow up to 1 week to review your application. Fish processors move raw fish through the various factory stations using machinery and conveyors. Job includes sorting, cutting fish and removing guts, packing fish into pans, placing pans in and removing pans from freezers, removing blocks of frozen fish from the pan, bagging the blocks, then stacking bagged fish in the vessel’s freezer hold. Required for Position: Open application, anyone can apply. Deckhands perform deck operations which include: set and haul back fishing nets, release fish into the hold; clean, maintain and organize fishing gear; maintain and repair nets and equipment; operate deck gear, hoists and cranes; maintain and operate skiff and life rafts; follow directions in the case of an emergency and work under the direction of the captain and mate. Required for Position: USCG AB License or equivalent experience on board trawler fishing vessels. Assistant foremen aid the factory foreman as needed to train fish processors and oversee factory operations as raw fish moves through the various factory stations using machinery and conveyors. Assistant foremen act as the lead when the factory foreman is off shift. Job includes assist training fish processors that are new to the vessel, oversee day to day operations as fish processors perform their required duties such as sorting, cutting fish and removing guts, packing fish into pans, placing pans in and removing pans from freezers, removing blocks of frozen fish from the pan, bagging the blocks, then stacking bagged fish in the vessel’s freezer hold. Required for Position: At least 2 years experience processing fish with a leadership role. Factory foremen manage, train and oversee factory operations and fish processors as raw fish moves through the various factory stations using machinery and conveyors. Job includes training fish processors that are new to the vessel, managing and overseeing fish processors day to day operations as they perform their required duties such as sorting, cutting fish and removing guts, packing fish into pans, placing pans in and removing pans from freezers, removing blocks of frozen fish from the pan, bagging the blocks, then stacking bagged fish in the vessel’s freezer hold. Required for Position: At least 5 years experience processing fish with a leadership role. The Vessels Purser/ QC Manager is responsible for collecting daily quality samples and communicating quality results to ship’s crew and shore based offices. Other responsibilities are vessel paperwork, data entry, and NMFS reporting. Required for Position: Fishing vessel experience, basic computer and Microsoft Excel skills. Assistant cooks work half of their shift as a fish processor and the other half assisting the cook with galley responsibilities. Galley responsibilities are assigned by the cook and may include meal and/or snack preparation, prep cook, cleaning, housekeeping and laundry duties for up to 38 crewmembers. Personal hygiene, food handling safety, and sanitation regulations in food preparation, service and storage must be followed. Assistant cooks also work half of their shift as a processor in the factory. Required for Position: Galley experience. Cooks are responsible for meal planning, preparation and service for up to 38 crewmembers working onboard. Three meals plus three snacks must be prepared each day and ready for the crew at their appointed break times. Cooks are responsible for ordering food and ship stores, following company protocol as set by the corporate office. They are also responsible for following and enforcing personal hygiene and food handling safety and sanitation regulations in food preparation, service and storage. Required for Position: Galley experience and are able to obtain a Serve Safe Certification. Assistant engineers work under the direction, guidance and training of the chief engineer to assist in operation, maintenance and repair the vessel’s operating systems: diesel engines, generators, refrigeration, electrical and hydraulic equipment, water making and sanitary equipment, deck machinery, factory equipment, pumps, cooling and conveyor systems. Assistant engineers, under the direction of the chief engineer may maintain engine room and other logs as required by the company or other agencies. Assistant engineers also assist in fueling the vessel and transferring fuel onboard. Required for Position: Engine room experience. Chief engineers direct, oversee, operate, maintain and repair the vessel’s operating systems: diesel engines, generators, refrigeration, electrical and hydraulic equipment, water making and sanitary equipment, deck machinery, factory equipment, pumps, cooling and conveyor systems. Chief engineers maintain all engine room and other logs as required by the company or other agencies. Chief engineers are also responsible for fueling the vessel and transferring fuel onboard. Required for Position: Chief Engineer license. Mates stands watch and manage the operation of the vessel as directed by the captain; supervises and directs deck personnel during fishing operations and port calls; coordinates with other vessel departments during fishing operations, offload, backload and during transfer of personnel; inspects all areas of the vessel on an ongoing basis to ensure proper storage of supplies and product. Mates maintain records, reports and documents as required by the company, the US Coast Guard and other agencies. Mates also conduct safety drills and train the crew in performing safe work practices in accordance with OSHA, company policy and other guidelines. Required for Position: USCG Mate’s License (min. 500 tons). The vessels Captain is responsible for directing safe and lawful operation of the vessel to ensure the safety, health and discipline of all crew onboard, and is responsible for the overall management and supervision of fishing and processing operations. Required for Position: USCG Master’s License. Experience onboard a catcher processor is not required to apply. Background checks are performed on potential employees. O’Hara Corporation has a Zero Tolerance Policy. Potential employees are required to pass a pre-employment drug screen. Random testing is conducted onboard our vessels. Wait to hear back from our HR team about an orientation/interview date and time. We do not currently support applications in person. Please fill out an online application and if selected we will follow up by email or phone on an orientation date and time. See our Orientation Schedule. Orientation time, dates, and locations vary. Our schedule is updated weekly. Check back frequently to determine the best session to attend. Yes, O’Hara Corporation has a Zero Tolerance Policy and you will be required to pass a pre-employment drug screen. Random drug testing is conducted onboard our vessels. Yes, criminal background checks are performed. A full contract is 75 days. New crewmembers sign an initial probationary contract. Detailed contract information is given out during your orientation. How many hours per day will I work? All crewmembers work 16 ½ hours per day, 7 days per week. There are no weekends or holidays. All crewmembers are paid by crew share, which is a percentage of the value of the catch for each trip. More detailed information about pay is given during your orientation.